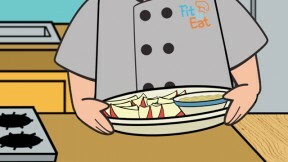 Chef Rob Stinson and Ed are in the kitchen making Sliced Apples and Apple Dip! This is a great snack that’s healthy too! Pour the water into a bowl. Squeeze the juice of the lemon into the water. Slice your apple into thin slices, leaving the skin on. Place the slices into the water. Allow the bowl to chill in the refrigerator – this will keep the apple slices from turning brown. In a separate bowl, combine all other ingredients and mix until they are even, smooth and one color. Dip apple slices in the mixture and enjoy!